If you want help publishing a book, or if you have any comments, questions, or know of a good way to dispose of used running shoes, email me at writeray@y42k.com or use the Contact form at the bottom of this page. 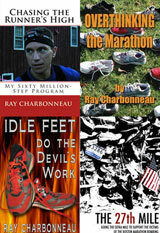 For regular doses of running news/history/fun and to follow what I’m up to, read my blog (or use the RSS feed) or follow @raycharbonneau on Twitter. On Facebook, I post more often, and more randomly, on my personal page. Register here to receive email updates when I have important news to share (new books, etc…). Messages will be few, and you can unsubscribe at any time. If you need help with your computer, I provide computer support, via phone and remote access software or on-site in the Arlington, MA area, through ReallyFixIt.com. I live in Arlington, Massachusetts with my wife, Ruth Sespaniak, and our two cats, Felix and Phoebe. Ruth and I can often be found running on the streets of Arlington, but Felix and Phoebe stay inside. I’ve run hundreds of races, including more than thirty marathons and ultramarathons, without winning a single one. But there’s always tomorrow. I published my first book in 2010. My work has appeared in both national dead-tree publications and landfill-saving electronic formats. You can find some of the things I’ve written here and here. If you like what you read, I can always use help getting the word out! When I’m not writing, I’m helping others share the excitement of seeing their own books in print (both on paper and digitally). In 1999, I was searching for an Internet domain name to use for my personal web site and email. I wanted a name that was meaningful, but most of the names I thought of were already taken so I needed something a little different. I was working in IT and the Y2K issue was big at the time. 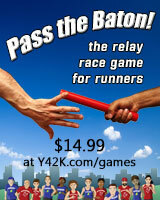 I took that and mixed it with the marathon distance (42 kilometers) to come up with “Y42K”. 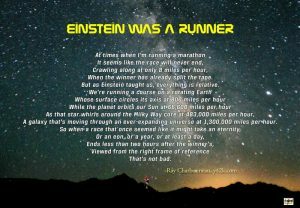 Since then, many people have asked me, “Y42K?” Some days “Y42K?” asks the question “Why run a marathon?” On better days, it asks “Why stop there?” It’s also sort of Shakespearian-sounding, which adds a needed touch of gravitas.